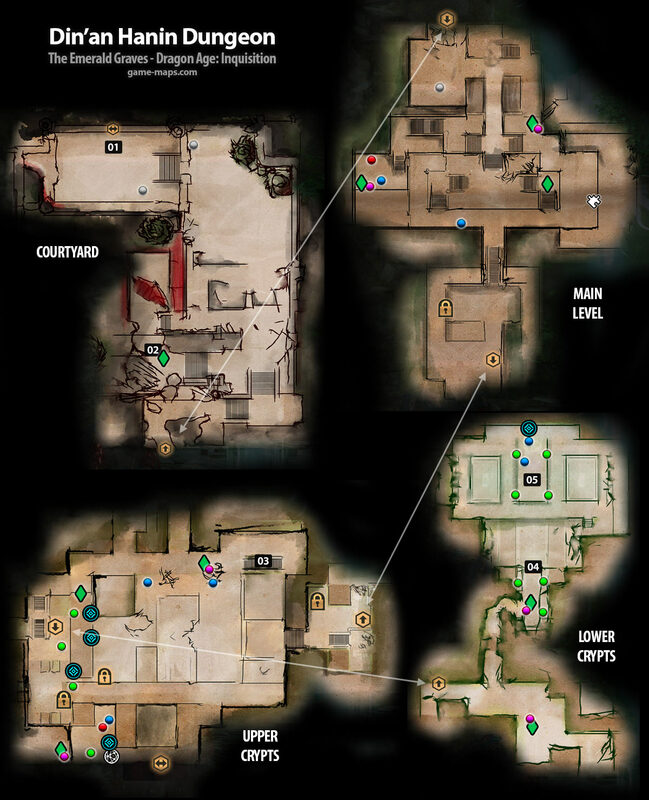 Din'an Hanin - Dragon Age: Inquisition Walkthrough, Game Guide and Maps, with Quest and Locations of Camps, Merchants, Rifts, Ocularums, Astrarium, Dungeon Entrences, Landmark (POIs), Crafting Station, Mosaic Piece, Inquisition Agent, Secrets, Party Members, Bottle of Thedas and Codex Entry. Din'an Hanin, resting place of the Emerald Knights. Inquisition contacts report a group of elves investigating ruins in the Emerald Graves. The ruins may be connected to the Emerald Knights, an order of elven warriors that predates the fall of the Dales. The history contained within would be of great value to the Dalish. The Emerald Graves has been experiencing unrest of late. If a small delegation met with the elves and offered assistance in their search, it could provide an opportunity for cooperation between the Inquisition and the Dalish, strengthening our reputation with the clans in Orlais. ITEM: Emerald Seal You will need 9 Emerald Seals to enter final chamber. There are two levels of Upper Crypts, so use this stairs to move between them. Light 4 Veilfires, fight undead and locate artifact in the center near statue.